David Harten Watson is the author of the Magicians Gold series, including Magic Teacher's Son (a 2016 Eric Hoffer Award Winner (Honorable Mention in category Young Adult), 2016 First Horizon Award Finalist, 2016 Eric Hoffer Award Grand Prize Short List, and 2015 IAN Book of the Year Award Finalist) and its sequel, Fortress of Gold. He also wrote the science fiction novelette Millennium Bomber: a Story of Digital Revenge. David is a member of the U.S. Army Brotherhood of Tankers (USABOT), the Mormon Church, the Campaign Against Killer Robots, and the International Committee for Robot Arms Control. David has worked in a dizzying array of jobs including U.S. Army Armor officer at Fort Knox (experience that came in handy for his second novel, Fortress of Gold), camp counselor at Keewaydin Camps, teacher, tax preparer, car salesman, portrait photographer, track photographer, solar energy entrepreneur, and computer programmer. Raised in snowy Buffalo, New York, David graduated from Calasanctius School (which closed shortly after his graduation, although he swears it wasn’t his fault) and has degrees from Princeton, Canisius College, and Buffalo State College. He's the Organizer of the Woodbridge Science Fiction & Fantasy Writers Meetup, which he founded in 2008. In his free time, David enjoys kayaking and acting (he had a major role in the feature-length, no-budget horror movie Coordinates, filmed in New Jersey). He lives with his wife (a native of Ecuador, not Eldor), their two sons, and two cats in New Jersey, where in his day job he's an IT Specialist. Fortress of Gold by David Harten Watson is the second book in the Magicians Gold series. Pran and his three companions, Vitina, Samir, and Jelal, travel through a portal to another world: Earth. Everything is going according to the prophecy. The group just needs to form a plan to steal gold from a world they don't understand. A world with horseless carriages and bizarre dangers they've never seen before. When Samir has an accident and is taken away, Pran and his friends must turn to a family who are believed to be their native guides for help. Before they stand a chance to get the gold they need, they have to find a way to get Samir back, but nothing is easy as the FBI takes a special interest in the kids carrying diamonds. Pran and his friends are labeled criminals with their only option being to trust their new friends, which becomes crucial when Jelal reveals a secret mission to bring back more than just gold. To make Pran's life even more complicated, he ends up in a love triangle. David Harten Watson explores complex relationships and layered characters in this delightful second adventure. Watson has a humorous and charming flip on the idea of characters in a strange new world, only this time, the new world is our own. They encounter a new language, horseless carriages, and the strangest magic of all: technology. Watson has plenty of jokes poking fun at society and technology that are clever and charming. Their time on Earth also has a thriller element woven into it as the FBI are investigating them and determined to catch them, which puts them on a time table. Each part of the plot is coupled with humor, family, first love, and plenty of romantic complications. Watson uses technology to explore the idea of magic through two perspectives. Pran and his friends see technology as this extraordinary creation because they've never seen a car or a microwave, while Oliver and his family see what Pran and his friends do as extraordinary. While dealing with heists and break outs, these teenagers are also dealing with matters of the heart rooted in Pran's feelings for Vitina and her insistence on those feelings being a side effect of her healing him. This leads him to explore his own feelings to figure out what's real, which is complicated when he figures out he has feelings for another boy. The romance is sweet and charming as they're still in a first love frame of mind and trying to understand what they're feeling. 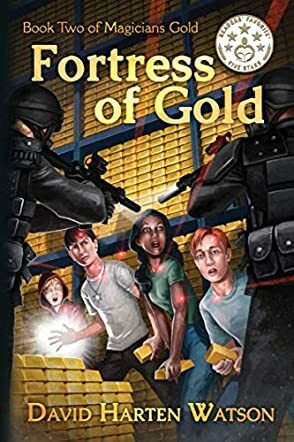 Fortress of Gold is a fun adventure with humor, action, romance, friendship, magic, and an unforgettable heist.